All I have to do is push that card in and close up my phone. I just added a significant amount of memory to my phone. On its own, my phoneÂ starts telling me I’m out of memory if I store a dozen photos on it. Not anymore! I can put hundreds of photos, thousands of songs, even videos on it with one of these cards in. I can pop that same card out and put it in my music player, too. I have a Sansa View, too, for listening to music and audio books I borrow from the library or buy at Audible.com. One of these cards holds twice what my player can hold.Â So adding a 16GB one to my View means it can hold 24 GBs of music, audio, and video. I’ll never run out of entertainment. Sweet! If you are in the market for a music player and don’t want to drop a lot of cash, you could get theÂ SanDisk Sansa Fuze , win this MicroSD card, and have a player that holds 18 GB for less than $50. That’s an 8GB card you see dangling out of my phone in this photo. But today I’m giving away a 16GB card. What do you have to do? Post a comment. That’s it. In fact, if you can’t find the slot in your phone, say that. I’ll see if I can help you out. Great little SDs! My Treo 755 only sees 4MB, alas! 2. two Deck brackets for 4x4s (Like two opposing “L”s joined at the toe, which is where I cut them apart.) with big hyoles through the main sides and flattened two of them. 3. a package of medium furniture glides you push in like giant thumb tacks, to slide over the front of the pedal. 4. a garden knee pad/stadium cushion-uncovered I cut in half, one for each foot. 5. a sprinkler system riser to fit overt he threaded rod. The point is that I had NO idea how I was going to do it until I began to find parts. When I finally found the brackets it was like I KNEW they would be there somewhere. When I got to work all I had to do was adjust the nuts and tighten them up to the modified brackets and it slipped right over the original pedal and into the gap, leaving just enough room for the heel to rise up below it. Give me a goal and a budget (enough cash), and I can make anything! Gathering is a concept that works for decorating an office or building an apparatus, you just do it in different departments. My husband sent me links to your site and to order your book. (I suspect he found you through Slashdot. :)) I’m not sure if he thinks I’m a geek goddess or just wants me to become one, but I’m glad he sent me your info. I look forward to reading more. As the mother of a pure blood chip head, I scan Slashdot for talking points and sound bites while in conversation w/ him. He says I know more than a lot of the other dinosaurs :-0. I would love to win the SD card so I could have something he would covet and could actually used it in the new ‘smarter-than-me’ phone he just gave me. I will be buying your book and plan to follow this site ‘religiously’, since that is my language, to further my own ‘capacity’. Thanks for breaking it down for us dinosaurs! The smaller the storage, the easier it is too loose. I am eager to loose it. And the Sandisk card. I also found my way from Slashdot, cool blog, I am reading yer archives. 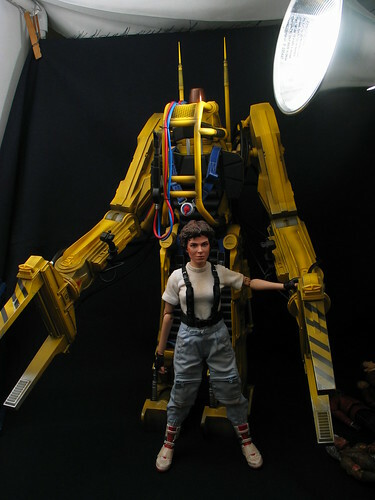 When I first saw the stunning Sigourney Weaver in the loading dock, “wearing” the walking powerloader in Aliens I got a giut feeling about technology can be a huge equalizer for women. Modern women should, in general, all be geek goddesses. So, as you are contributing I am pleased to join your contest and push your book. I cant find a movie still showing the fight scene, but here i9s a model of the suit/forklift/walker with a model Weaver. Got here Via Slashdot on the Geek Goddess post. Oh the things I could do with a 16GB MicroSDHC card! I bet I could store every single geocache on the planet. I could put my music library on my cell phone. I could take about 6,000 pictures on one of my cameras. I wonder if I could partition it, make it bootable into Helix or Backtrack, but still leave 8GB free for a FAT32 partition for windows security utilities, forensics stuff, and general items? I would have to put it in something and just leave it there though. Those things are SO small that they can be instantly lost. This is pretty sweet! I didn’t know they had cards with that kind of capacity. Can’t wait to unload half my ipod onto my phone! I want it! I just found the slot on my Centro. Thanks you for your excellent blog! Wow…this is a great giveaway. At the moment it looks like my chances are pretty good! I followed a link here from slashdot where I read a short review of your book (How To Be A Geek Goddess) and I’m glad that geekiness is finally shedding it’s ‘boy’s club’ image. Keep up the good work and thanks for the shot at the memory card! BTW, my favorite JS movie would have to be the first Transporter movie. Holy solid action, Batman! not all devices support MicroSDHC; therefore, cannot use 16Gb card. Mine maxes out with MicroSD at 4GB. I was going to purchase one from Amazon but they’re on back order. Soon to be wife and I are going to Prague and Vienna for honeymoon and this would be great for all the snapshots. I love SD cards. I use them in my phone, camera, and my laptop has a convenient little slot to read pictures from, or to push mp3 onto. A 16Gb would be brilliant! Not long got the book, found the link and here I am. Love the site! Currently work in IT but am far from an IT person, usually do legal admin and there was an opening for someone to undertake all the document/precedent stuff. Love IT but feel out of my depth most of the time (although I cant be entirely bad as I have been there for a few months now), and being the only girl in the section doesnt make it any easier. Again, gr8 book and site (already added to my favourites)! don’t need the memory card unless I can plug it into my brain,but I sure do like the picture! Those small yet incredibly massive cards are great. I have a new netbook (oh how I love my purse-sized computer) and it has a slot for one of those cards. That’s one of the kinds of “removable media” it uses. One of my favorite forms of removable media to use is still the jump drive (flash stick). Darn, I thought you were giving Jason Statham. Then I read the post and my heart slowed to a normal pace. Still a sweet giveaway! Because he is HOT. And muscle-y. 🙂 My favorite movie of his is The Italian Job.